Click on settings icon at the left side of the top to configure the basic settings. To restore all your email templates to the default style, use this Reset button to restore all the templates. To display the payment instruction, for example: If you are using Bank transfer as your payment method and would like to show the bank details in the order email, use this option to show it on above the order table. Choosing yes will show the product's thumbnail image in the order item table. 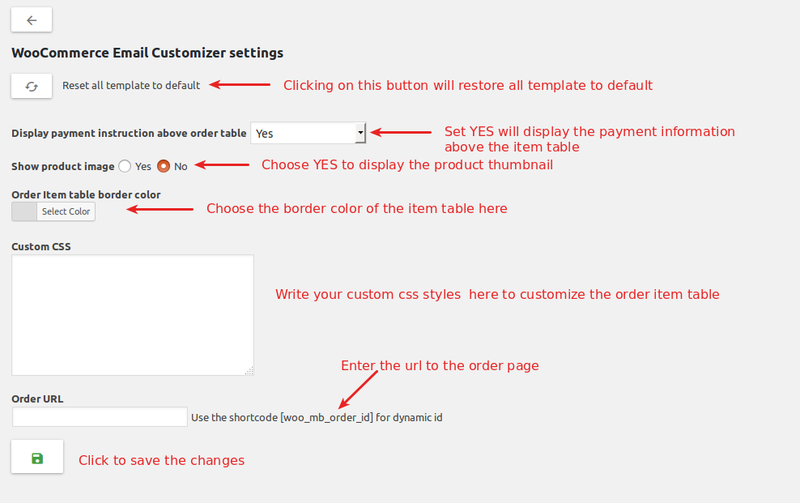 This option is used to set the border color for the order item table. If you wants to style your email template using css, then add your custom styles in the text area provided here. Enter the URL to order page you have in your website, if you would like to add the link to the order page in your email. If wants your customer to be redirected to particular order, use the short code [woo_mb_order_id] at the end of your order page url. And then use the short code [woo_mb_order_link] in your email template to place the link. Finally, click save button at the bottom of the page to save the changes.